Anna Meryt Writings: Did I mention that I was going to Barbados? Did I mention that I was going to Barbados? I went on the 9th and just got back. I had been once before but that was a long time ago in not so pleasant circumstances. This time I was going to see someone, someone I've known for a long time, someone with whom I have a lot of history and a big connection, someone I'd been missing.. That's all I'm going to say about that subject. The apartment we stayed in was in a two-storey pale green, pebble dash block. It was on the first floor. He opened the door with a flourish and I walked in, seeing all the flaws first – the seen-better-days kitchen, somewhat down at heel, opening the drawers and cupboards and seeing they needed a bit of a clean inside. The same in the bedroom – the wardrobe needed a wipe over inside, the paint was chipping off here and there, dust had accumulated in all the corners of the rooms. Then there was the colour scheme – walls were sunshine yellow, the kitchen cupboards were lime-green and all the curtains were a pale pink. It might have worked if the walls had been white or the curtains had been … any other colour. The cupboard under the sink – I shut the doors quickly – it looked dark and spidery. But then I began to see the positives – the balcony with table and chairs looking out across a green to other houses and you could just glimpse the sea, the large living room and bedrooms. What! No hot water! The water coming from the shower was tepid, but it was hot, very hot outside. I couldn't bear anything hot anywhere near me. And then there was the beach, Butterfly Beach. After we had unpacked and I had cleaned out the drawers and laid kitchen towel in each, we strolled down the road for a hundred metres, crossed a busy road and walked down a gap between some buildings onto a beach that was mind-blowingly beautiful – white sands, pale turquoise sea and creamy waves breaking along the sweep of the small bay. This beach was about two to three minutes away from the apartment. We swam into the waves and splashed about until we'd cooled down, then strolled back with pizzas. By the end of my trip, the apartment felt cosy and homely and I didn't want to leave it. Not only was it close to the sea and transport, but from there you could either get a mini bus to Oistins, a few minutes away, or you could walk along the road by the long beach front. At Oistins is a large supermarket and a variety of other small shops selling most things. Our first big shop to stock up, cost $200 (Bajun)-- c £65. Guess what though - it is well stocked by Waitrose products, from yoghurts to wines. Food prices are high in Barbados, prices are similar to UK. Difficult for Bajuns on much lower wages and Barbados too has been hit by the recession, with a big drop in tourist revenue, high prices for basic commodities. However, although people are often poor,there were very few beggars in the areas we went too and quite rare to see a rough sleeper. The first three days I did a lot of sleeping, I always get hit hard by jet lag and the heat – each day it rained , usually in the afternoon – a heavy burst, drumming loudly on the roof of the apartment. Each morning was hot and sunny and I went down to the beach for a swim – there were big breakers coming in sometimes on the beach and swimming was good for surfers. One day we took the bus – a green bus to Speightstown and for most of the ride I was the only white person. Every bus journey cost 2B$Ds – about 65p. No matter how short or how long your journey it costs the same. I love local bus journeys, in whatever country I happen to be in. They tell you so much about local people and ordinary life in the country. There were older ladies, straight-backed and erect, with floral dresses and hats. There were young boys with caps pushed back and jeans slung well below the top of the buttocks – they looked like they came from north London. People often hailed my companion, they'd known him since his school days and then they'd chat in incomprehensible Bajan dialect, which is musical and lilting and rounded, the consonants are flattened out and the words blend together. One of my favourite heard responses, if someone calls or phones and asks how you are, the answer is “I quiet”. The bus hurtled along a meandering road up the west coast through towns and villages and green areas. Barbados is very green, in spite of the heat, a tropical moist heat which I was beginning by the end of the nine days to get used to, but often I felt devoid of energy in that heat. We jumped off the bus at Black Rock (not a small village as I had imagined but a large sprawling town) and we went to Sunday lunch with my companion's mother – salt fish, macaroni pie, plantain and steamed vegetables, made specially for the vegetarian. When I arrived she took both my hands and greeted me warmly. We left and continued the journey to Speightstown, the old bus took about half an hour. We sat outside in the Fisherman's bar and had a cold beer, then walked through the town. I went on to the beach and paddled, skirts tucked in to my pants. All the shops were shut, there was no one about – they still have Sunday closing in Barbados which has a large practising Christian population. The following day, after a lazy morning we again took that bone-shaking battered old bus up the west coast and this time got off before Black Rock and walked through to Paradise Beach. It was baking hot, I had on my factor 30 and a large brimmed hat. By the time we'd walked a mile along the beach, my thin cotton T-shirt and shorts were damp and limp. We walked off the beach to what looked like someone's house, which turned out to be a bar, a rum bar. A group of men were outside playing whist round a table, they looked like businessmen taking a break . I drank my ice cold coke fast and it tasted very good in that heat. 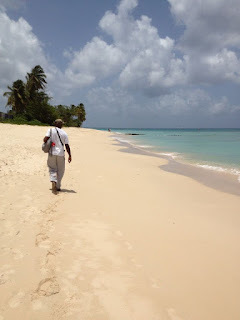 We walked back to Paradise Beach – miles of white sand and the usual translucent turquoise sea lapping quietly along the shore. We passed a derelict building spread out with gardens that had become completely overgrown- the former Paradise Beach Hotel, once vibrant and full of tourists, beautifully laid out paved gardens and palm trees and fountains. All now gone to seed and overgrown with weeds. We passed through a small copse of almond trees and I picked up a handful of almond cobs from the ground. Then on to Brighton beach – several miles again of white sands and palest blue sea. After a quarter of a mile, we had passed no one and I was wilting again. We came off the beach through a fence and there was an apartment belonging to a friend of my companion who insisted on putting up a sunbed and umbrella on the almost deserted Brighton beach where I lay and read my book, drank cold water and swam while the men talked over a few beers. Another day, we went to a kind of country fair in a large field, inland from where we were staying, at the top of the hill near Oistins. There were two main focuses of social activity – the beer tent and a kind of cricket pavilion with karaoke. There were about 80 to a 100 people there, and I was the only white person again. I suppose I felt like I stood out, that I could not blend into the background because of it. I wondered what they must think of me. Was I welcome? Or not? Although of course people were friendly. One thing about the gathering, for the first time in a long time, I felt positively skinny! Bajun women do not hide their size under loose tops and quiet colours. Lose a few pounds - whatever for! I had macaroni pie from a stall and he had chicken wings. We listened while we ate to some karaoke ranging from awful to brilliant – the latter a woman with a voice like Adele. Later, I had the best home-made coconut ice cream ever and we walked the 2 miles back to the apartment. On my last night we went to St Lawrennce Gap and strolled roung a kind of lagoon area and up a wide street, past small bars and restaurants. There were tourists scattered around but my companion was very surprised that along our walk, isntead of the flocks of tourists he had been used to not so many years ago, we passed almost no one on our walk to the kareoke bar. Some great singers there - all Bajun of course and I had a go twice - well no one I know was listening (apart from him and he was encouraging me) - I was pretty dreadful I have to admit, but hey! The days had passed in a haze of rest and walking and reading and swimming. Barbados is beautiful, but is mainly conducive to indolence. I did no writing at all. I will go back one day soon.